scscofield and millest like this. Last edited by Old Man78; 10-23-17 at 06:58 PM. 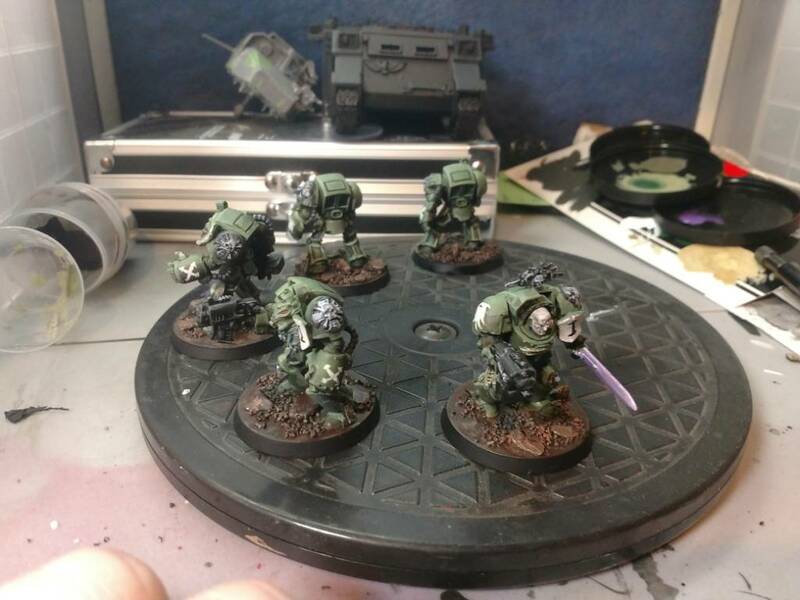 Sounds good to me with the suggestions, will prob try and do the power weapons in the same shade of purple as the plasma coils. Will do both a yellow and a orange for the eyes then decide or post here to help decide later tonight or tomorrow. 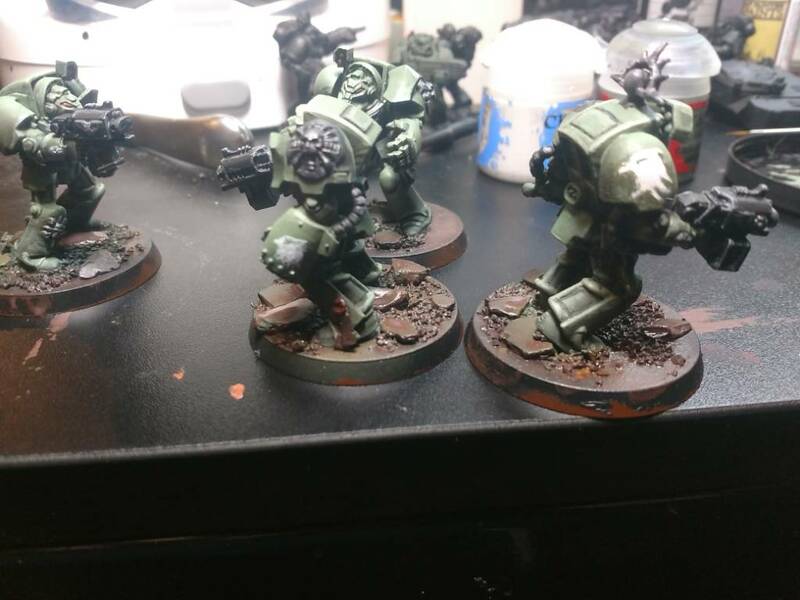 Would like to finish the terminators by tomorrow but that will depend on work and whatnot. 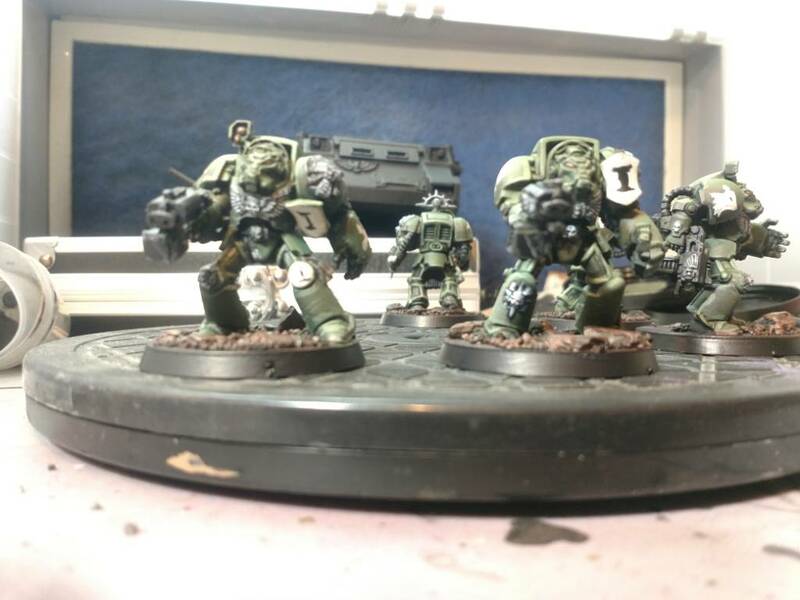 Attempting to freehand things, conclusion I need more practice. . Also not sure where to put all the various company and chapter markings on terminators. 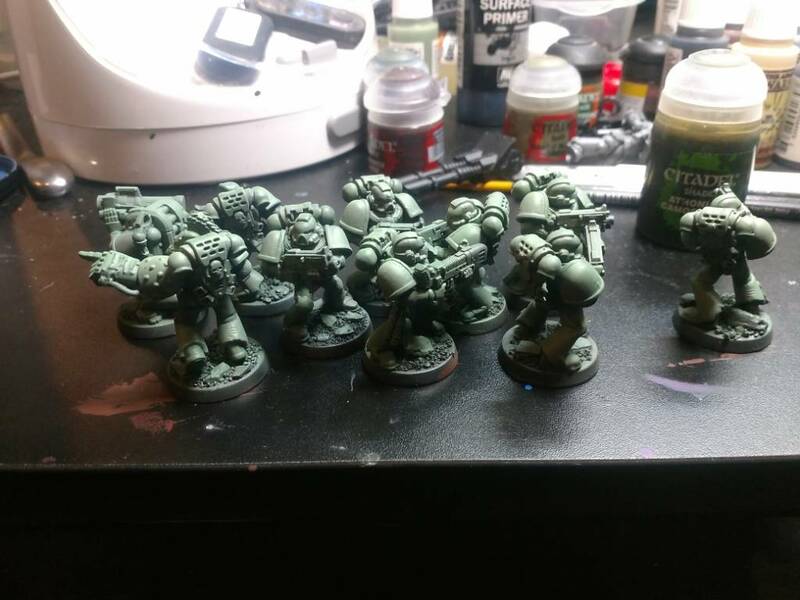 Need to finish skulls, crux, anquillas, Sgt sword and doodads, and the bases. 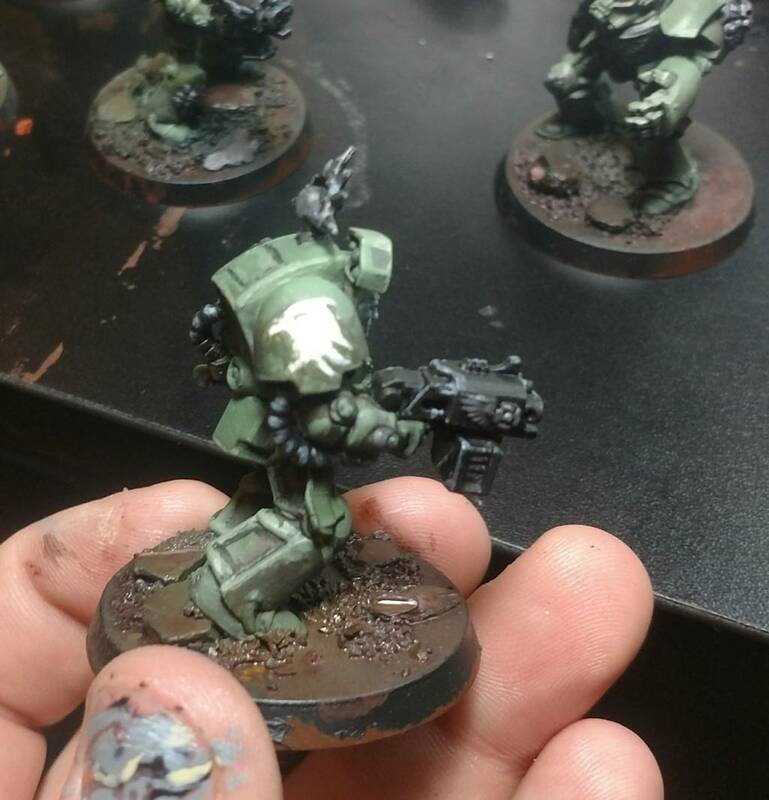 Also am probably going to keep attempting to freehand the chapter icons onto them. 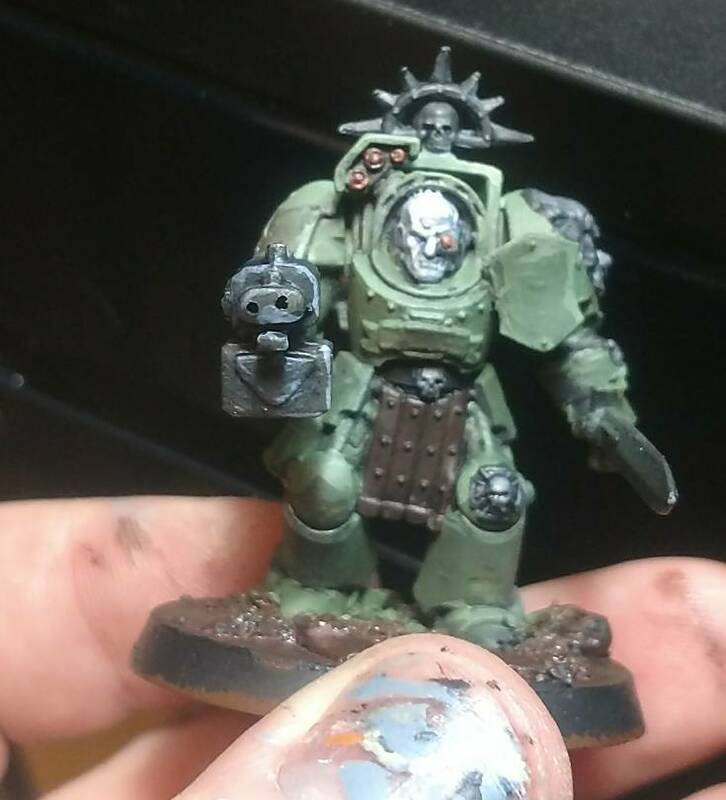 Debating how dark to keep the various imperial icons. 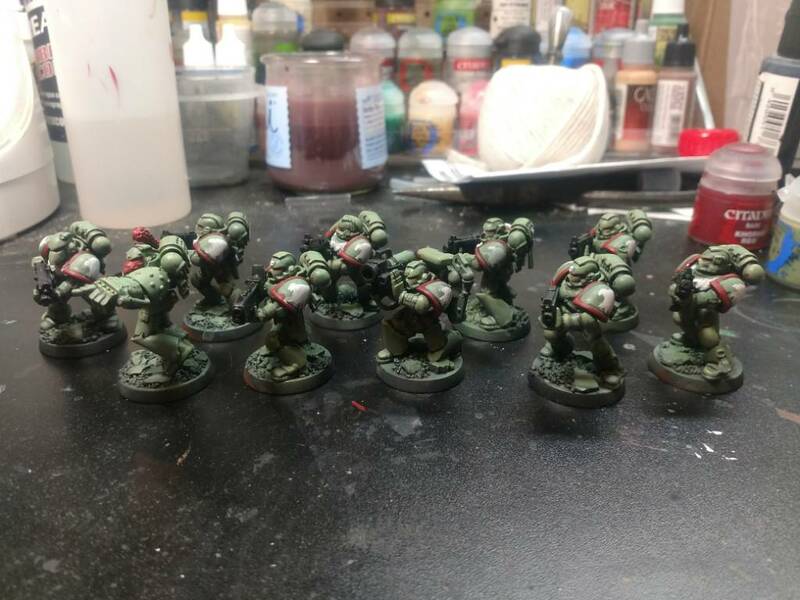 I think I am going to call these done. 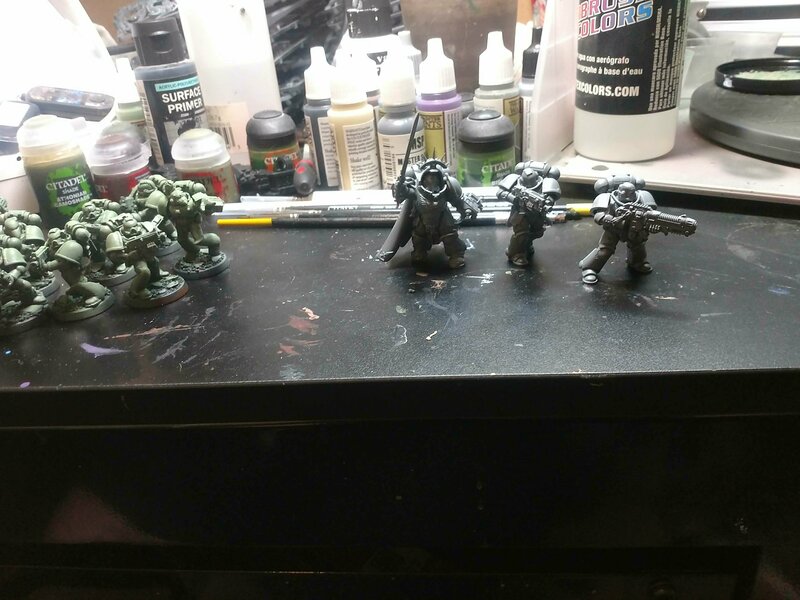 Mistakes have been made on them, horrid ones in my viewpoint but I have a wall of grey plastic screaming for paint. I need to buckle down and accept and learn as I do instead of obsessing over ever detail. I also need to slowly start buying a larger range of paints. Many of my original paints are dried out. Old Man78 and Brother Dextus like this. 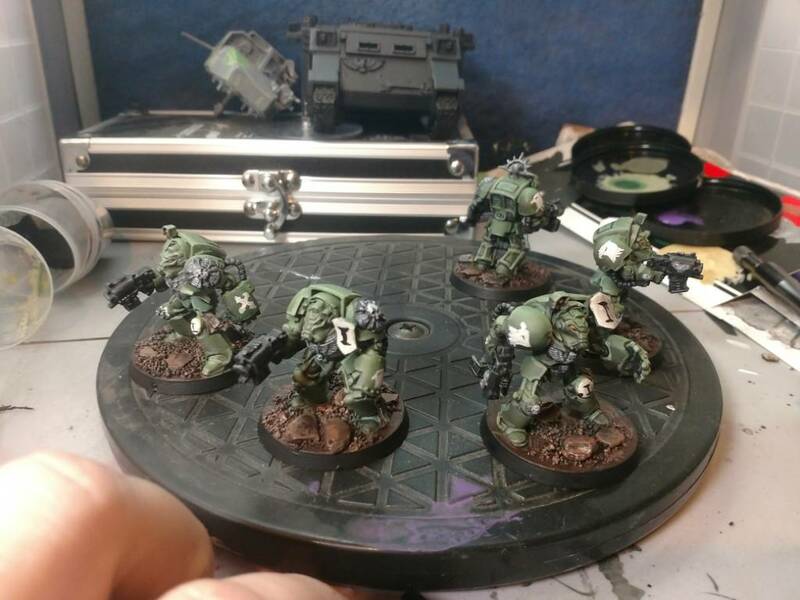 Base coat done on the tac squad, plans are to have them finished by Monday. Would have been further along and original plan was done by Saturday but I played a game last night and will play another tomorrow night. I don't mind that kind of delay in the least. Managed to test out the full list and I think it will do decent overall. It might need some adjustment as time goes on but for a quick list for casual playing at the store it will work well. 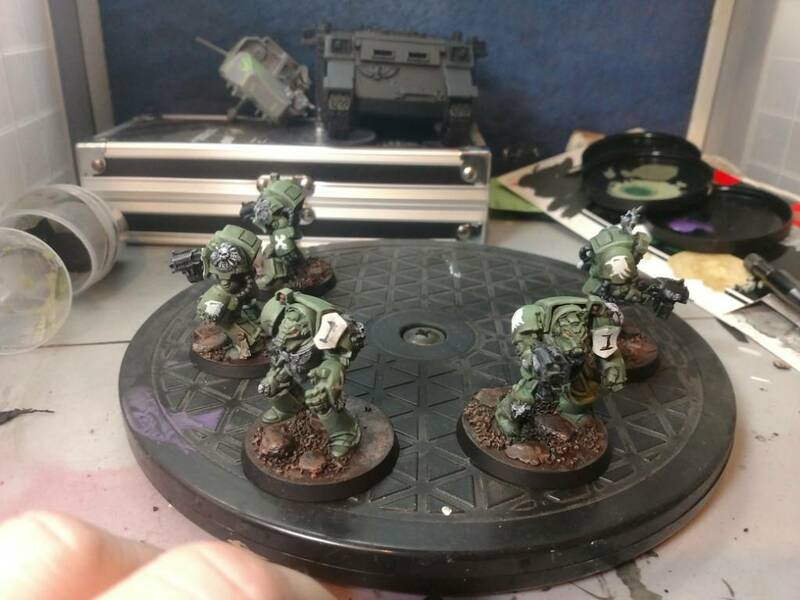 Need to decide what company these guys are, the Termies were easy because the whole Codex rules means they should be 1st company. Overall it isnt anything critical, it just will effect what color the trim of the shoulder-pad will be. 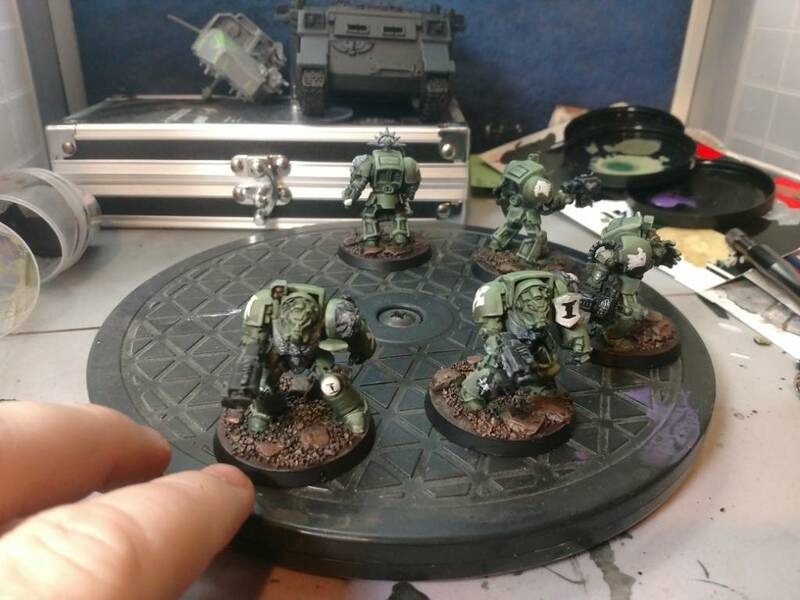 The SGT will also need something different for his chapter icon location, I do not want to attempt putting it over that studded shoulder-pad. Currently thinking I will do the battleline arrow in black then the chaper icon in white over it on his other shoulder-pad. That is enough rambling for now. 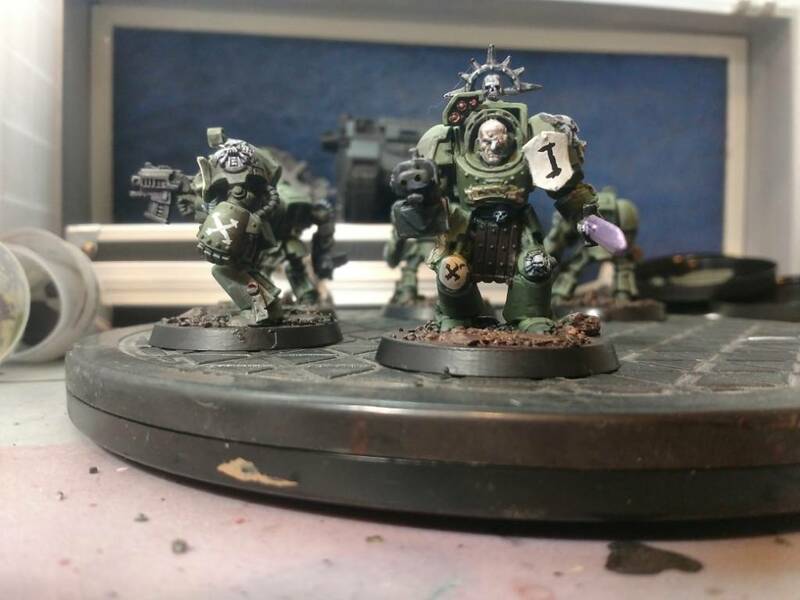 I might be getting the DG side of the Dark Imperium set this weekend for the store demo game set. I will probably start another plog for that paint job. 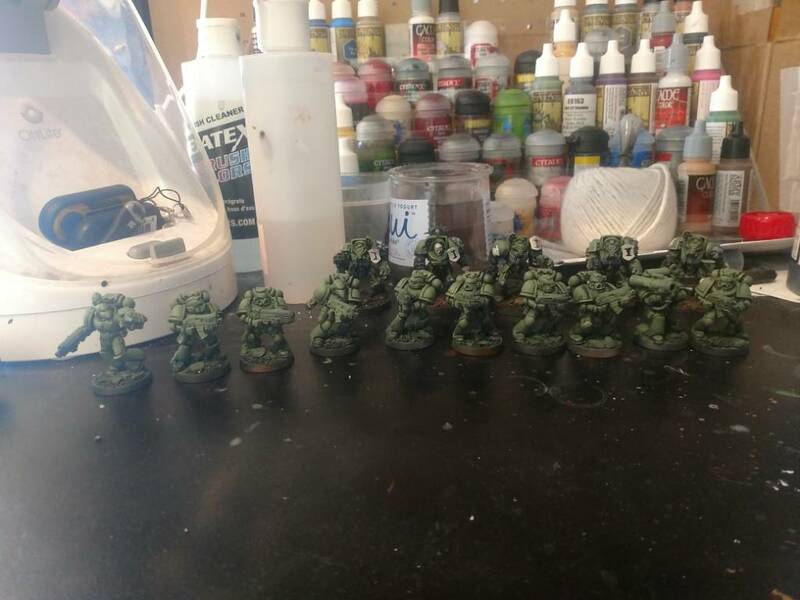 This army might sit for a week or two so I can pound out that set of minis, I offered to help do demo games on weekends once or twice a month and want to have the starter-set done for it. Last edited by scscofield; 10-27-17 at 01:49 AM. So drunken experiments leads to sober attempts to fix them :p.
I decided to try a extreme highligh shadow thing then wash it to bring the color in. 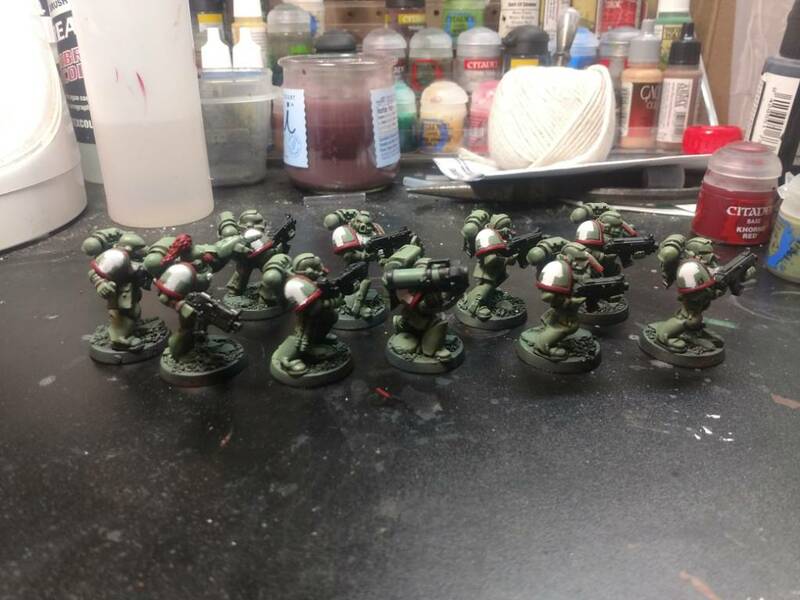 I used Beil-Tan green though and ended up with Jolly Rancher Green marines. That is the above photo. The photo above is me taking my two highlight colors and watering them down in a 1:1 mix so that it was mostly a glaze. This took away the Jolly Rancher Green effect. 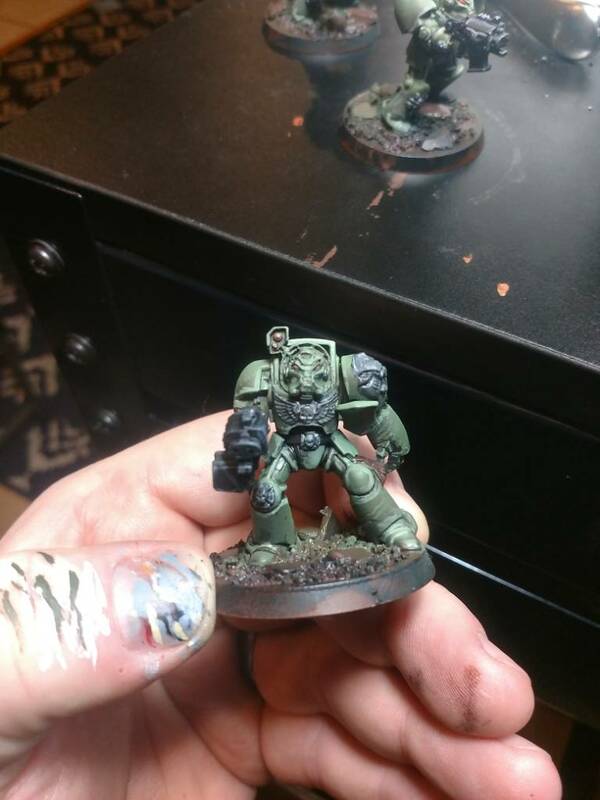 Then I used the wash I bought today, Athonian Camoshade to give them an all over wash. It seemed to have for the most part solved the issue. I plan to start the brushwork on them tomorrow. 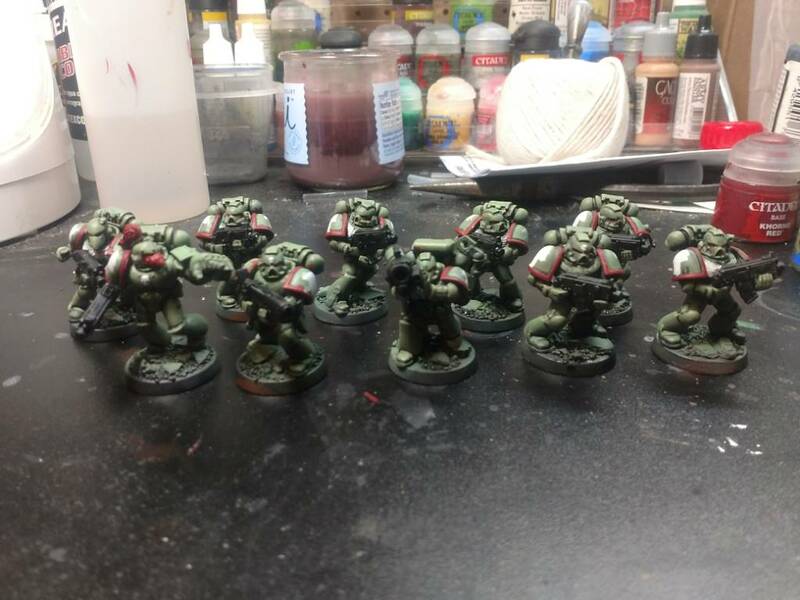 Drunken experients coupled with airbrush clog issues (solved by giving all the parts an acholhol bath over night) means that I am not going to reach my Monday goal finishing these. I do plan to push to have them done before mid week though. For now though this is my stopping point for tonight. Last edited by scscofield; 10-30-17 at 01:01 AM. Not much changed in progress. 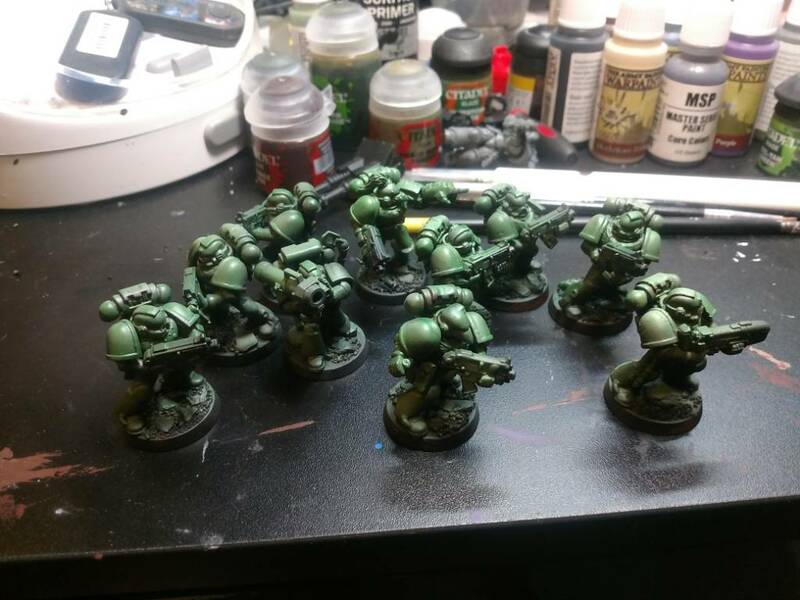 It was busy at work this week, I started to assemble the Primaris set. I just picked up the DG for the local store demo set. That will be the focus for the next couple weeks. 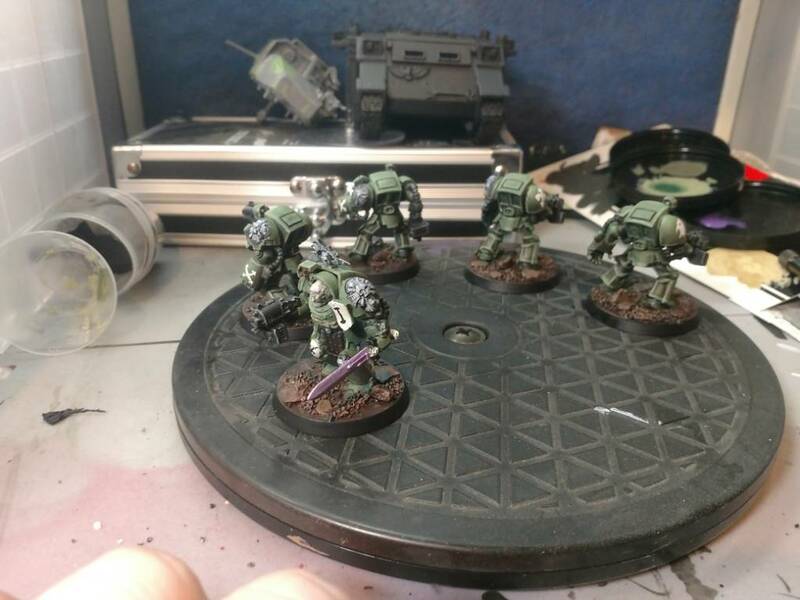 Back to work on the Raptors, did the blacklining on the Tac Squad this morning. Depending on how the day goes I might try to finish them off today. 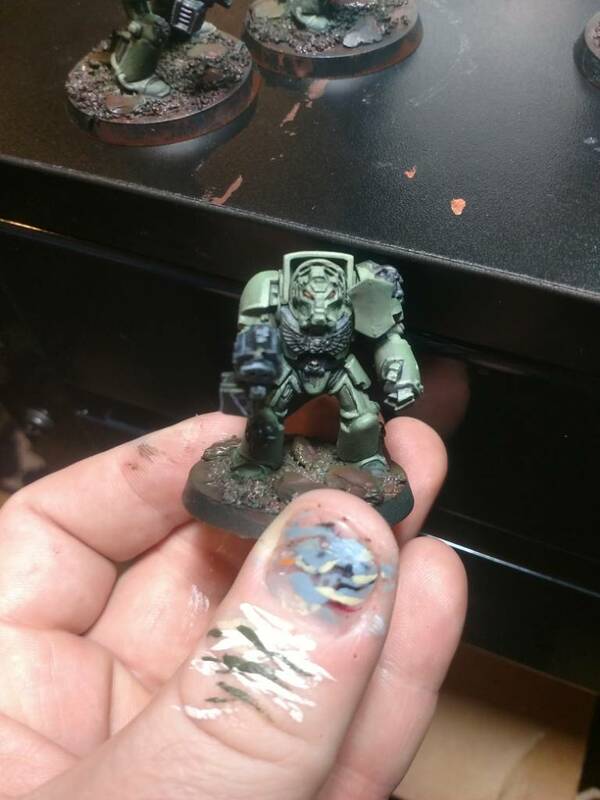 PSA use one coat of rattlecan primer, better yet buy a cheap airbrush set and prime your models with it. 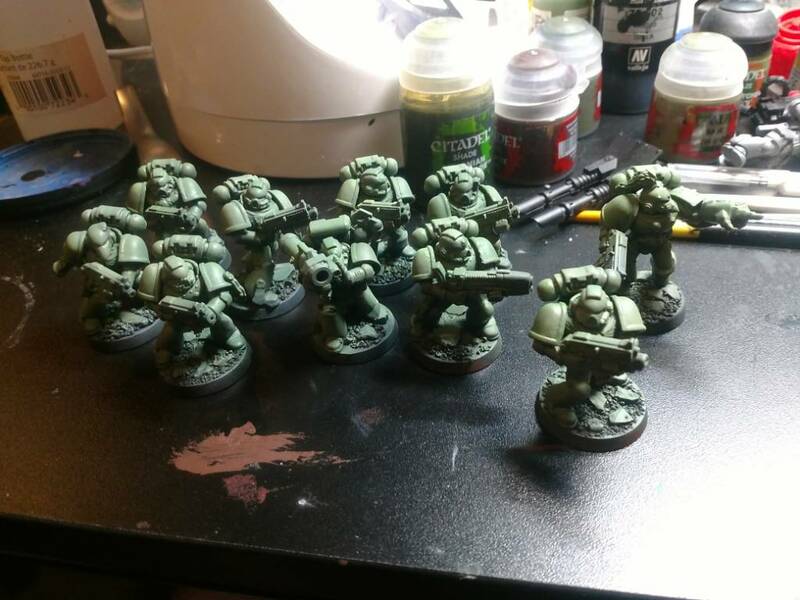 These guys were the first set of marines I ever bought and have at least a couple layers of rattlecan on them because I was stupid. I am pretty much free handing the details back onto them because the are that clogged with primer. 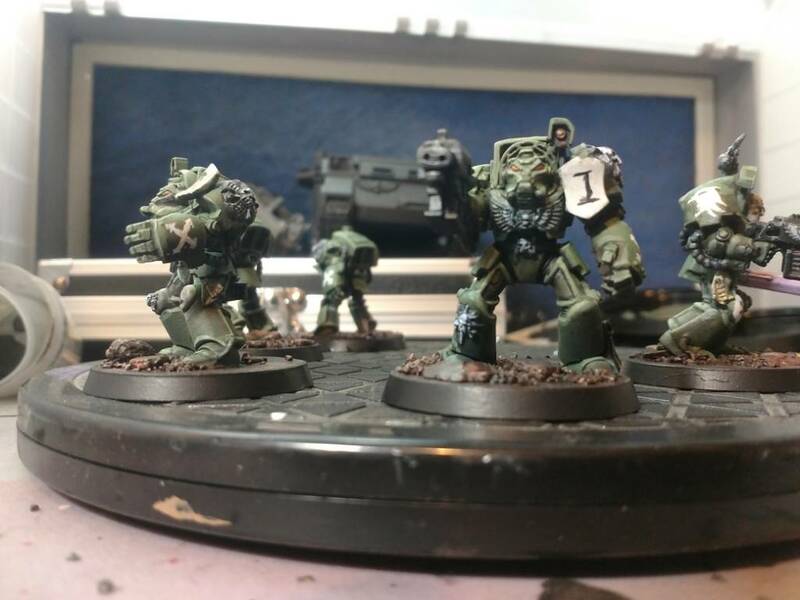 Need to clean up the shoulder pads and the icons on them still. 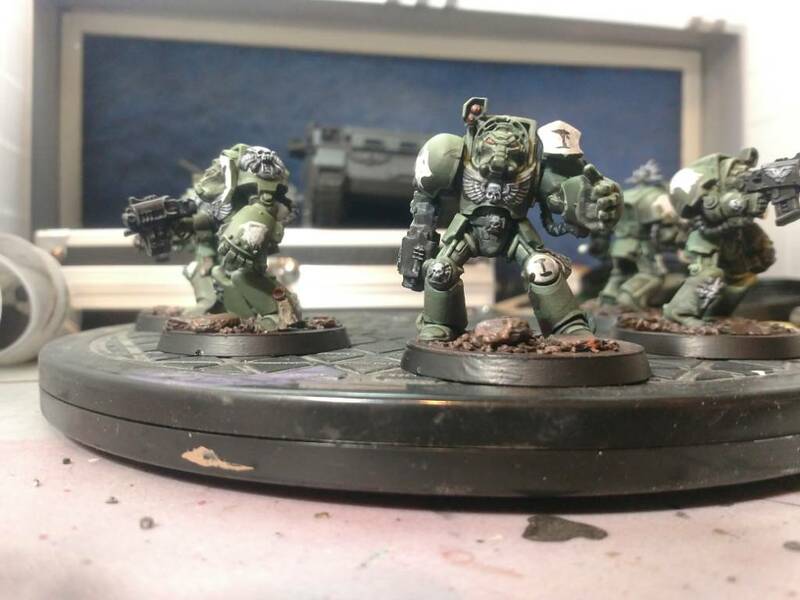 Also need to highlight weapons and do the small detail work like purity seals and pouches. 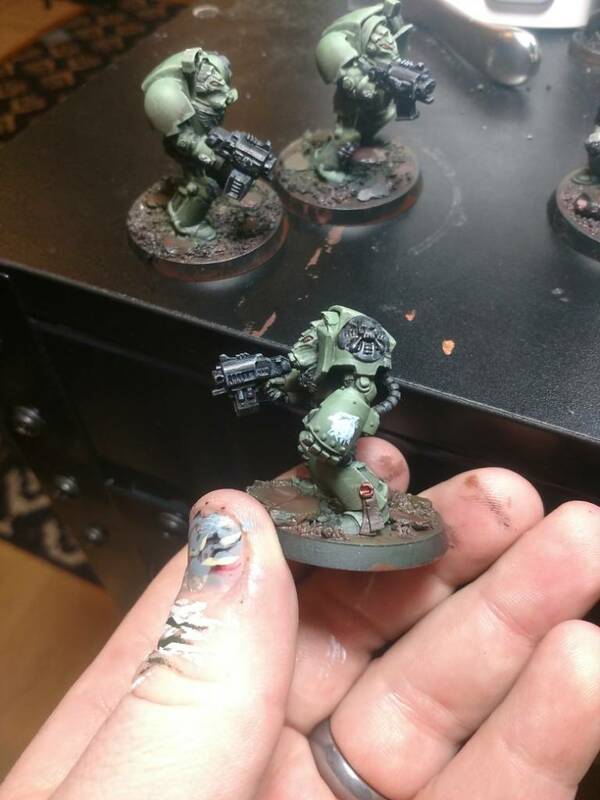 Decided my list will be from 3rd company hence the red trim. That's enough painting for today though. Last edited by scscofield; 02-11-18 at 09:42 PM.